What’s better than a snack that takes 2 ingredients, ridiculously little hands-on time, and delivers flavour that is better than anything you can possibly buy from a store? NOTHING! And that means nothing is better than these 2 Ingredient Jalapeño Popper Crisps. How good are these? My kids described 2 Ingredient Jalapeno Popper Chips as being “like the best, cheesiest, cheez-its ever on steroids.” I think that sums it up pretty well, too, but I can expound; they’re dead crispy and crunchy, but they don’t crumble when you dip them. Jalapeno cheese crisps are pretty. Well, at least they’re lovely to me, but I’m inclined to think that any food that tastes this good is simply stunning, too. 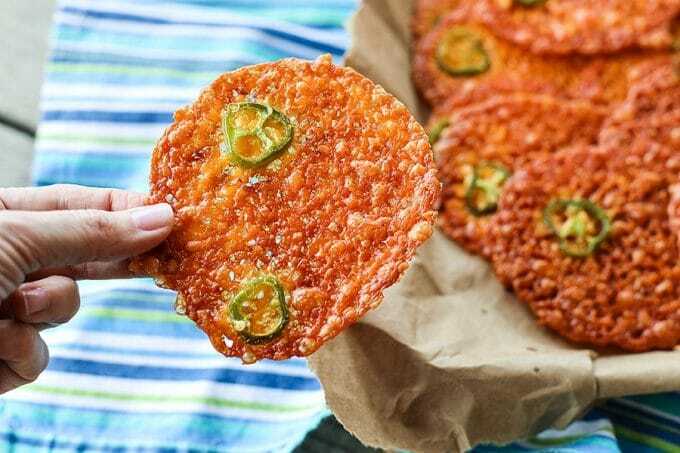 It only takes two ingredients to make these spicy cheese crackers, and people, it is so worth it. You’ve never had a better cheese cracker with soup or chili, stew or salad. And if we’re talking about homemade crackers for snack time, this is the one you want all the way. 2 Ingredient Jalapeno cheese crackers are the ideal base for deli ham or turkey for an excellent, fast, low-carb/high-protein snack. When it comes to choosing the cheese for the 2-Ingredient Jalapeño Popper Crisps, I highly recommend extra-sharp cheddar cheese. This is my favourite cheese for the job because it delivers a major punch of cheese flavour. If you prefer a milder cheddar, go for it. I do recommend you grate your own cheese for 2 Ingredient Jalapeño Popper Crisps because the pre-grated cheese is tossed with an anti-caking powder to keep it from clumping in the bag. Not a big deal in some recipes, but when you WANT your cheese to melt and cling together, it gets in the way. Let’s talk about cracker size. You can make these smaller using about a tablespoon of grated cheese, or make them larger, using about 1/4 cup of grated cheese, or any size in between. Just watch the baking time and use the colour of the cheese crisps as an indicator of when to pull them from the oven. Speaking of cracker size, if you do the smallest size jalapeno cheese crisps, you’ll only use one thin slice of jalapeño. 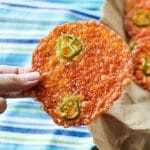 If you make the largest jalapeno cheese crackers, you can use two thin slices. You don’t want to overload the crackers, though, as the jalapeños give off liquid as they bake. 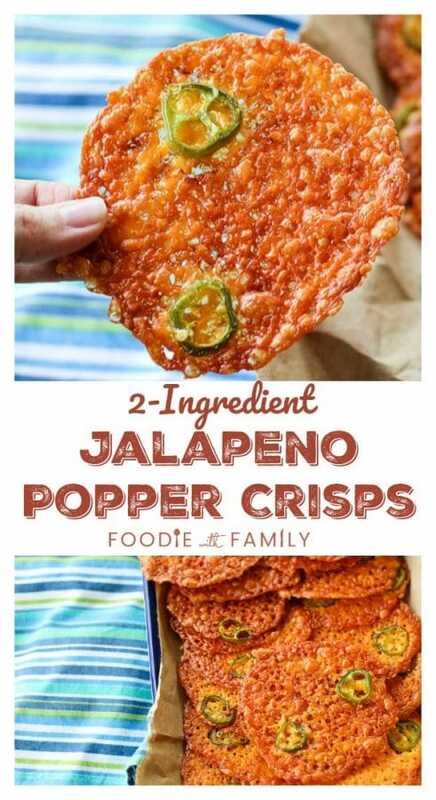 Look how easy these 2 Ingredient Jalapeño Popper Crisps are to make! 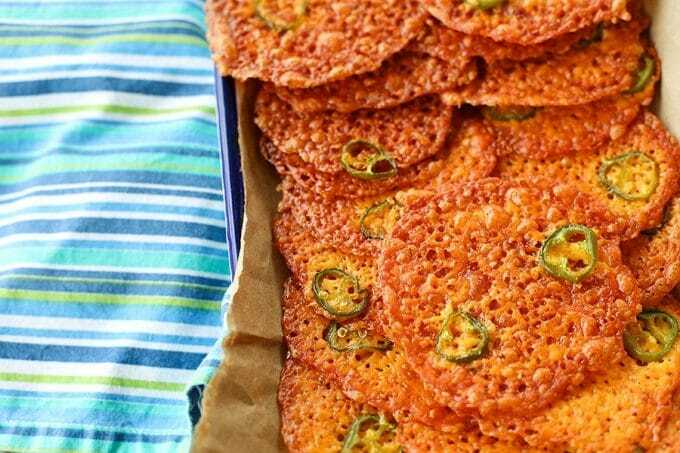 2 Ingredient Jalapeño Popper Crisps are deliciously cheesy, dead crunchy, slightly spicy, ridiculously simple to make, high-protein, low-carb crackers for snacking, soups, salads, stews, and much more! Preheat oven to 375F. Line a rimmed half sheet pan with a silpat or parchment paper. For small crackers, divide the cheese into 1 tablespoon mounds of cheese, leaving at least 3 inches between the mounds, adding 1 slice of jalapeño on top of each one. For medium crackers, divide the cheese into 2 tablespoon mounds of cheese, leaving at least 3 inches between the mounds, adding 1 to 2 slices of jalapeño on top of each one. For large crackers, divide the cheese into 3 tablespoon mounds of cheese, leaving at least 3 inches between the mounds, adding 1 to 2 slices of jalapeño on top of each one. Bake for 8 to 15 minutes, or until the cheese has melted, bubbled, and turned a uniform deep golden brown. The oil will be bubbling around the cheese and the cracker will be set, but pliable. Remove the pan from the oven and let rest for 3 minutes before transferring the crisps to a paper towel lined plate to finish cooling and crisping up. Store leftovers in an airtight container at room temperature. If they become stale, you can re-crisp them in a 375F oven for 3 minutes. Do you love these Jalapeno Cheese Crackers? Try these Jalapeno Cheese goodies! I’m looking for a true Italian spaghetti sauce with or without meat. Would greatly appreciate your speedy answer. We would love to eat these. They look so good. Will have to try them on a Saturday when our son comes for dinner. Thanks for the great recipes and tips. You’re welcome, Ginger! I hope you love these as much as we do! How well do you think pickled jalapenos, or your candied jalapenos would work? I love the tangy bite or the former, and the sweet punch of the latter. Too much moisture? I haven’t tried it with candied jalapenos, Lindsay! I imagine they’d work alright if you dried them off thoroughly with a paper towel, first, but that’s pure guesswork. Do let me know how they turn out if you try them, please.